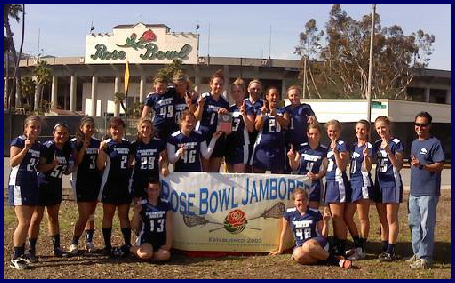 Again, a similar script for Trabuco Hills at Rose Bowl Jamboree — a nail biting finish to win the consolation trophy in the top flight! Mustang Varsity rushed out to a 5-2 halftime lead over Great Oak as Jessie Papageorge’s scored three times plus goals from Rachel Lansner and Alex Miller. After the break, the Mustangs were headed to what seemed like an easy win — after goals by Justine Tobias, Lizzie Moore and Kayla Ruiz — when Great Oak rallied to tie the game at 8-all. But Trabuco Hills got a late goal from Hannah Redwine to clinch the Mustangs’ second consecutive Rose Bowl consolation championship. Papageorge’s added three ground ball pickups and two assists — Moore also had two assists — in the win. Goalie Alyssa Ransom had two saves. Notes: Ten different Mustangs scored on the sun-baked day … A year ago, it took a late four-goal rally and an overtime goal to beat Redondo Union and win the same trophy.